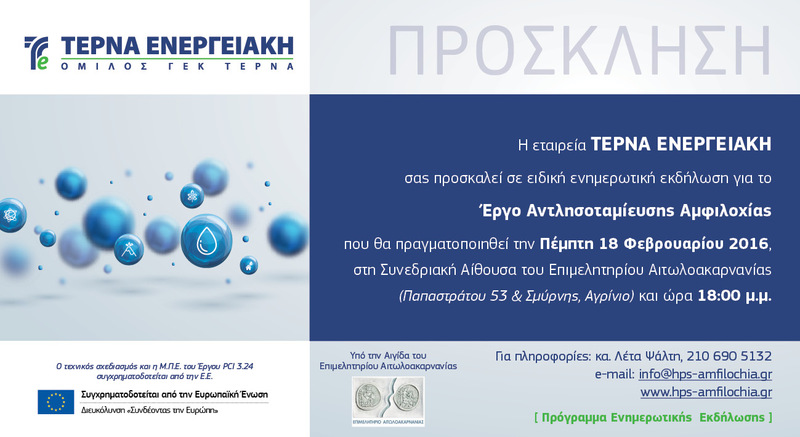 TERNA ENERGY, under the auspices of Aitoloakarnania’s Chamber, organizes on Thursday, 18th of February 2016 at 18:00hrs, in the Chamber’s Conference Hall (corner of 53 Papastratou & Smirnis Streets, Agrinio) informative event about the “Hydropumped Storage in Amfilochia” Project. The event will be open to the public and aims at presenting the project and its expected benefits. The open character of the event seeks to inform the public and instill its active participation in the design process and licensing of the project. A former informative event for the project has already been successfully realised in the Municipality of Amfilochia, whilst a similar one is expected to follow in Athens.